A well presented detached house situated in an elevated position in a sought-after residential cul-de-sac towards the outskirts of Seaford, about a mile and three quarters from the town centre. The property offers good sized family accommodation with the ground floor comprising sitting room with inglenook fireplace, kitchen/dining room, study and cloakroom. On the first floor is the master bedroom with fitted wardrobe range and en suite bathroom, three further double bedrooms and a family shower room. 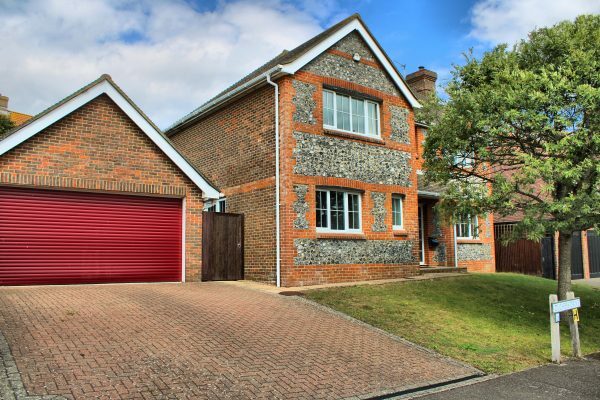 The double garage is approached via electrically operated roller door and paved driveway, providing off road parking. Gated side access path leads to the enclosed rear garden which has the advantage of a full width paved terrace, with the remainder laid to lawn and arranged on two levels. The property also has the benefit of uPVC double glazing, gas central heating, and is offered for sale with no onward chain.